"It's not the years, it's the milage." God loves Indiana Jones. I came to that jolly conclusion early in Indiana Jones and the Kingdom of the Crystal Skull, when Indy sealed himself in a lead-lined refrigerator and improbably survived a nuclear explosion. Radiation-poisoning-free, mind you. The hazmat team even scrubbed his sankara stones to be sure. God must love Indiana Jones. I suppose when Indy did the Almighty a solid and saved the Ark of the Covenant from falling into Nazi hands all those years ago, God has kept a special lookout for him ever since. Don't call Indiana Jones and the Kingdom of the Crystal Skull a comeback, he's been here for years. 19 years have passed for us and for Indy since he and his father rode off into the sunset at the conclusion of Indiana Jones and the Last Crusade. Sadly, Professor Henry Jones and Marcus Brody have passed on. Indy himself is older but more bemused. He's literally seen it all, done it all. 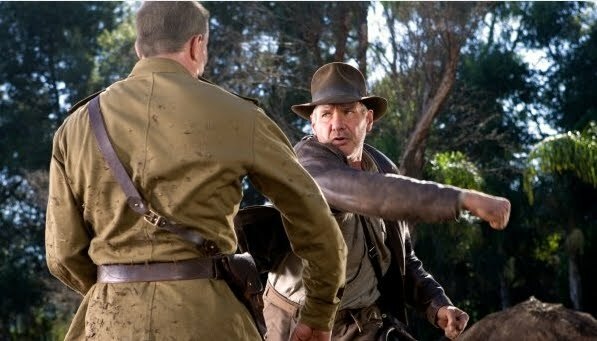 Some of the most fascinating stuff for me at the beginning of the film was the revelation that in the interim since we saw him last, Indy never stopped having crazy adventures. In the 1940's he joined the OSS and, as Colonel Indiana Jones, continued to crusade against the Nazis, performing secret missions all over the globe. Man, I'd love to hear those stories, but Indy never has the time to tell any. He's too busy running off on another crazy adventure. For some reason, I was approaching Indiana Jones and the Kingdom of the Crystal Skull like it was Indy's last hurrah. Which it may well be, but Indy himself never gave the slightest indication that he's done with his adventures. He never stopped while we weren't watching and doesn't plan to even now that he has an instant family. He'll just bring 'em along. The best thing about Kingdom of the Crystal Skull was the 1957 setting. It was the era of beatniks, greasers, the Red Scare, the atom bomb, flying saucers, and men from Mars... rumors of them, anyway. Silly rumors. No such thing. Planting old man Indiana Jones, a pulp magazine relic of the 1930's, right in the middle of it all was more fun than the latter half of the film when they whisked off to South America and wandered onto the sets of Apocalypto. I liked the fight between the jocks and the greasers in the diner that lead to Indy and Mutt Williams fleeing from the KGB on a motorcycle across the campus of Yale, sorry, Marshall College. And I enjoyed the opening sequence where a captured Indy is brought by the KGB to the US Government's secret warehouse in Area 51(!) and how during the entire melee of Indy's escape, they were completely unaware that the Ark of the Covenant was right there the whole time. This is the first Indiana Jones movie where they found the artifact in question halfway through and someone had to lug that goddamn crystal skull around half of South America. That seems to be the only reason John Hurt was in the movie. Sometimes the crystal skull was magnetic, sometimes it wasn't. As much as I missed Sean Connery, he probably read the script and saw it was originally gonna be his job to haul around that stupid skull and decided he'd rather play golf and stay retired. What can you say about Harrison Ford besides he's still got it. He has more of it than he should. I remember after all the fights he had in Raiders of the Lost Ark, a sore Indy needed time to sleep off the beatings he took from the Nazis. Now over two decades older, Indy has the ability to take even more brutal beatings, shake it off, and keep going and going across deserts and jungles without food or rest. Maybe drinking from the Holy Grail had some aftereffects where Indy... oh, who cares. No one seemed happier - a little too happy - to be in the movie than Karen Allen, who was the first and best of Indy's lovers and the mother of their son, Henry III, aka Mutt Williams (Shia LaBeouf). Mutt named himself after a dog the same way Indiana did. What a climactic instant-applause tease where Mutt picked up the famed fedora and Indy snatched it away from him and took it back. That's exactly right. That kid has a long way to go before he can ever fill his father's fedora. I liked Cate Blanchett's rapier-wielding Russian villainness and how bold the KGB is in the movie where they just roll around the United States attacking Indiana Jones in the middle of town and somehow don't get captured by the FBI. Then there was Indy's treacherous sidekick played by Ray Winstone. He kept betraying Indy, changing his mind, and betraying him again. It didn't seem to bother Indy all that much though. Though it's the least necessary of the saga, Kingdom of the Crystal Skull is absolutely 100% an Indiana Jones movie. They're older, maybe a little crazier now, and (unfortunately) a lot more into CGI than they used to be, but overall, Indiana Jones and the Kingdom of the Crystal Skull was a return to form for Steven Spielberg, George Lucas, and Harrison Ford. A return to what they invented and still do better than anyone (though not as well as their younger selves) - the old fashioned, globe-trotting, pseudo-history, I'll-be-damned, kind of adventures where anything goes.